New in the extraordinary series hailed as “a true frolic into fantasy” (Fantasy Bookspot) by a “Master Magician" (Midwest Book Review). 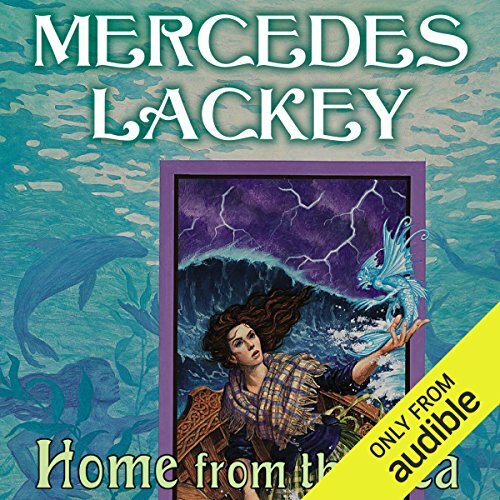 ©2012 Mercedes Lackey (P)2012 Audible, Inc. I couldn't put the book down, the story had me captivated throughout. From start to finish the book is a sweetly woven work that all Lackey fans should enjoy. The narrator did a fine job as well. 4.5-5 stars, but really, only because it's Mercedes Lackey, who is my ultimate comfort food novelist. While there was a great deal of STORY, there really wasn't any conflict until the last quarter or so, and the Big Bad Guy(s) was fairly non-fleshed out. Wasn't really a complex story, but it was, as I said, comfort food fluff, and I'll be reading it again. Of course. If you're new to ML, I wouldn't start with this book, as it doesn't show the awesomeness that is Misty, but then, if you're new to an author, you shouldn't be starting at book EIGHT of a series. The story is not so well woven as some of the others in this series, but it is a good addition since it introduces the water masters. I loved the Selkies and the description of live at the Welsh seashore. In my opinion, the background stories of the English/Welsh conflict, the coal mining and the constable did more to hinder than bring action to the lovely story about out-witting a generation old bargain . What I loved especially: that this story again linked into older ones (Wizard of London). It is always fun to meet characters again: Yay Puck! Lackey has once again written a very believable and gripping Elemental Masters book. Her use of prior characters as grown women and her introduction of new characters keep the story both feeling like an old friend and giving us new friends as well. Use of the Selk stories and myth give the story an old world flavor while contrasting it against the "modern" London and UK of turn of the century England. I was glad to see she did not create a new occult boogeyman/nemesis, but instead allowed the complications in the story to be created by greedy, suspicious humans and jealous, power hungry Selks. A refreshing and different change from her previous books with their good vs evil themes and this time allowing a believable and creative solution to the problems the new Elemental Master faced. Well done and as satisfying as usual. I have enjoyed Ms. Lackey's books for many years. This was as good (great) as the other books with the added surprise of her referrals to another favorite character Amelia Peabody. Since I have read all those books as well, this made Home From The Sea all the more fun. Thanks for a great read. I was astounded by Kate Reading's performance of both female and male characters with Scottish, Engish and Welsh accents. It improved my understanding and set the mood so wonderfully. Just incredible. Another wonderful , light, easy read / listen. "Home From the Sea" is a continuation of " Wizard of London" which introduced the characters of Nan and Sara, and I'm happy that Ms. Lackey has continued their story. For some reason, Michell Ford (one of my favorites) did not repeat her role as narrator. But, don't sweat it... Kate Reading is a total pro and delivers a very enjoyable narrative, which, considering the Welsh being thrown around, had to have been very challenging. She pulls it off without a hitch. Recommended for all of you who like this genre. I love this book and I love all of her stories. my only complaint is the reader did not pause between story changes so I was often confused what was happening. An excellent entry in her Elemental Masters Series, Home from the Sea touched on Selkies--a much beloved set of mythical creatures I used to read about as a child. Moreover, this book gives us a look into how the various magical creatures in the world of Lackey's fantastical imagination interact with humans, magicians, and Elemental Masters, while giving us a fantastic story that feels both modern, and classic fairytale. Mari is likable character who has flaws, growth, and personality. Her stakes are extremely personal, easy to empathize, or relate to in some moments, and I truly hope to see her and her family in future books. Another gem from Mercedes Lackey! My initial encounter with Mercedes Lackey's writing was Arrows of the Queen, the start of the Herald Talia series, back in the early 1990s. I was hooked. Since then I've read a great many of her books and, almost without exception, enjoyed them immensely. She is, after all, an exceptional storyteller. I've haven't read all of the Elemental Masters series but this one intrigued me. Major kudos to the narrator for her performance of the Welsh accents of the several of the main characters and the beautiful pronunciation of the names of all of the various creatures out of Welsh folklore. The story, the characters, the locations are all very well done and thoroughly engaging. If you're already a fan of Lackey's work, you'll enjoy this addition to her bibliography. If you are a lover of fantasy and good storytelling and considering this book, I highly recommend it!